PAC asked Reno Angelo Leplat-Torti, an artist and curator of exhibitions of Chicano prison art in France, to tell us a bit about himself, how his interest in prison art developed, and what kind of impact his exhibitions are having. My name is Reno Angelo Leplat-Torti. I was born in France, but my family emigrated from Italy in the 40’s. I studied art, and then I became an assistant in two different art schools’ silkscreen workshops. I created my own publishing house 10 years ago, and I’m also organizing a big alternative comic festival in France. I’m trying to keep my own “artistic practice” in the midst of all that. I’ve been interested in “folk art” and in what French speakers call Art Brut (“outsider art”) since my early artistic beginning. 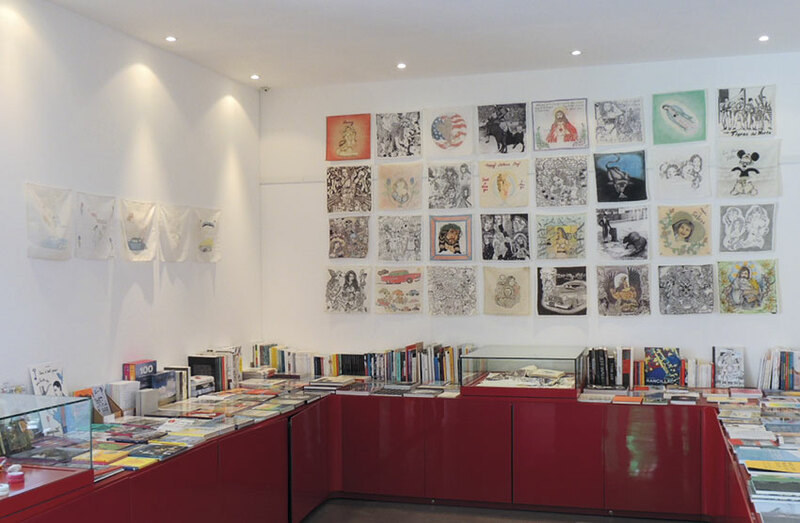 As a teenager I was a bookshop rat, and I started to read underground comics like Le Dernier Cri publications. There, I discovered the raw drawings of Stu Mead, Mattt Konture, Moolinex, GaryPanter, Henry Darger and Raymond Reynaud…I began to draw my own comics, found my passion, and began to pursue my own path as an artist by entering art school. I have always been interested in autodidact art, and discovered prison art while I was looking for prison-made objects like tattoo machines, knives, etc. My first find was a Mickey Mouse hankie, or paño, which I framed. Over time my collection of paños began to grow, and one day a friend with an art space asked if I’d like to exhibit them. When I’m setting up my exhibition, I really see the wall as an expression of emotions. 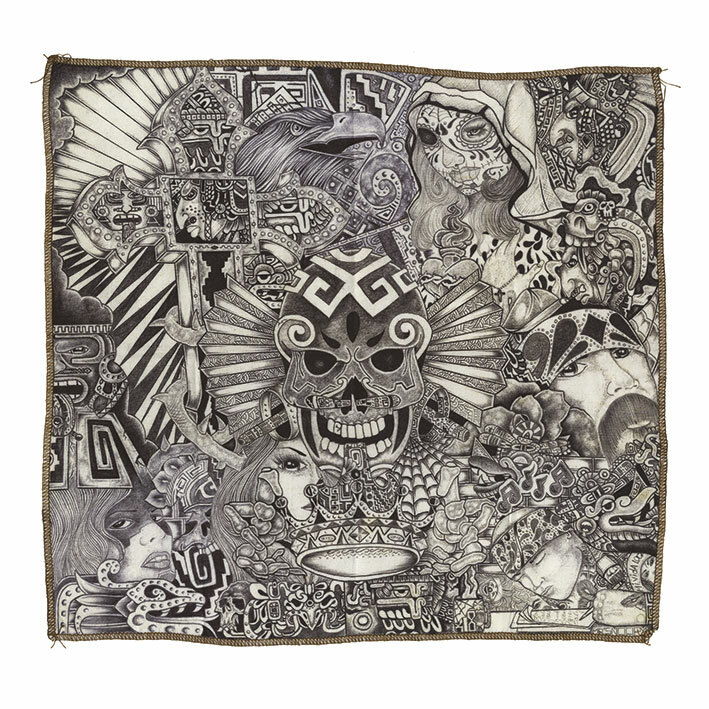 I feel paños art is something more intimate than a classic prison drawing, more personal. They are windows into a pinto’s heart, and viewing them can feel intimate, almost indecent, like reading a letter belonging to someone else, but the letter is so well written you can’t stop until the end – like the shame you can feel in reading the correspondence between Simone de Beauvoir and Nelson Algren. Paños art is so interesting to me because of the different dimensions it represents. 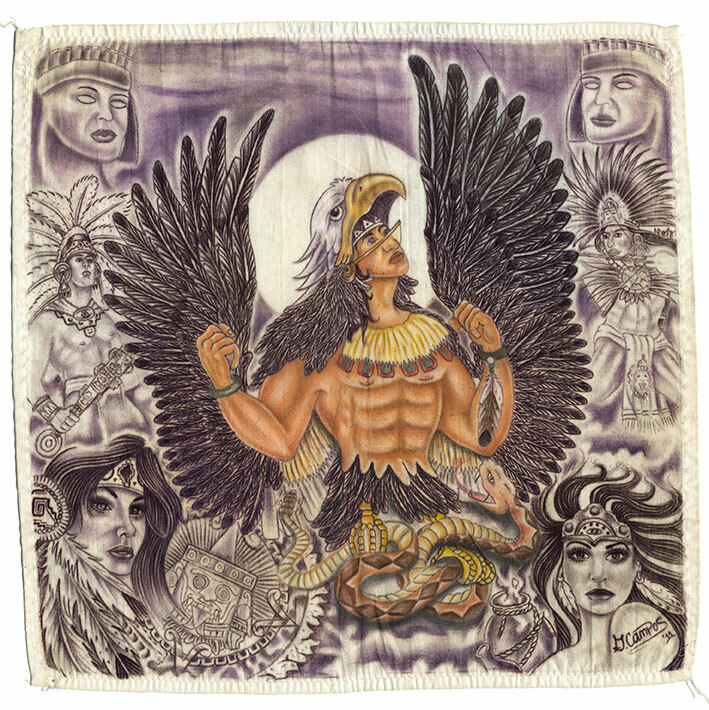 First, this form has connections to Chicano art, tattoo art, and religious art. But also this art form is a prime example of “making the most of what you have” – the artists are cutting up their pillows and bedsheets, and drawing with whatever they can find inside. 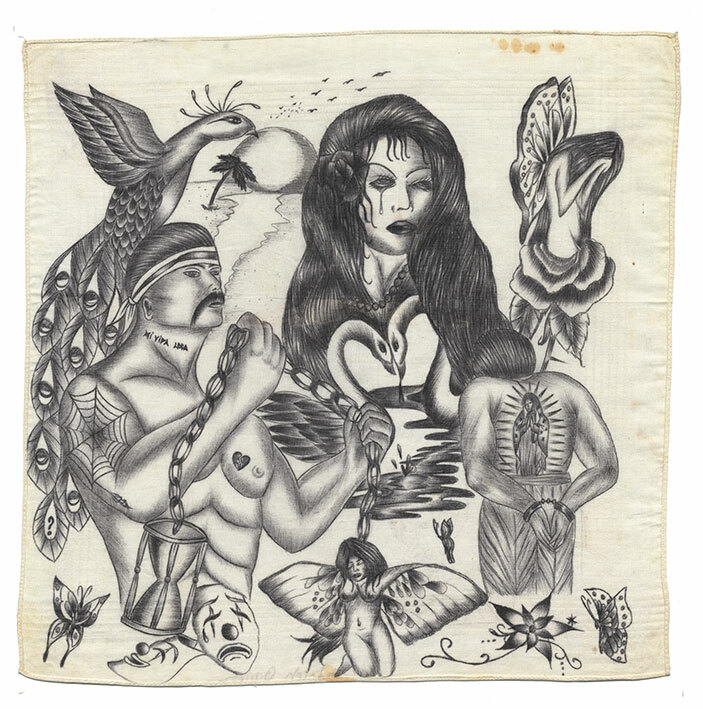 It’s not always a technical challenge – the pintos (Chicano slang for “convict”) are not always excellent drawers – but they have time and they put their heart, their soul and their guts in it. And finally the content, the prison hankies are often the only way pintos have to make a gift and express their feelings. To develop contact with the artists whose work I collect and exhibit takes a very long time, because we need to trust each other, and this is certainly more complicated for them than for me. Because I’m living in Europe it sometimes takes three weeks to receive a letter, so to exchange is not easy. Most of the time I’m in contact with family who send my mail. One guy sold me his hankies during his first week of freedom, first to ward off bad luck, but also because he was needing the money. Now he’s able to follow his own exhibition on Facebook, and he’s helping me a lot. With the families and the inmates I’m now developing very specials links. I’m trying to help them as much as I can, and I think creating these exhibitions is like helping them to travel – they’re locked up, but a piece of their hearts takes a plane and visits Europe. I try to send them photos as often as I can. People who visit the exhibitions react very strongly, and most of the time in a positive way. When people in Europe discover my collection they usually haven’t seen paños before, but they have a lot of references. The American prison system is maybe better known here than the French one, especially through the cinema. We don’t have gangs but people are really curious about them. I have found that when people see the paños, they recognize some of the codes and symbols they see in American movies, hip hop music, and tattoo art. It’s great to be able to share these life testimonies with the public. I once did a workshop in a jail in France. I brought a few paños to the prisoners. My idea was to expose them to that practice and then have them draw their own handkerchiefs using their own codes. I didn’t want them to use the Chicano aesthetic. That was my first time in jail, and at the beginning I really didn’t know if they would like my ideas. 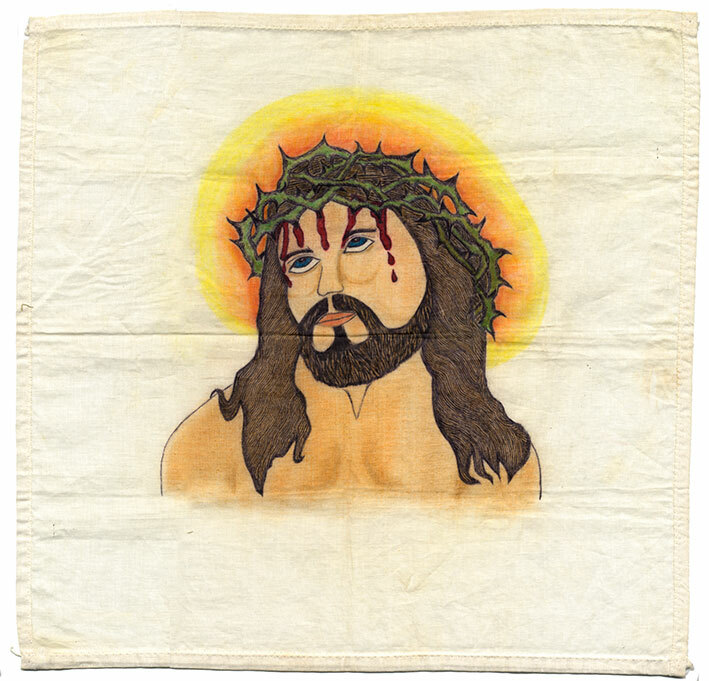 But when I showed them the hankies they were totally amazed by them, and by the thought that Latino gang members, who they perceived as “tough guys,” can take a pen and draw to express their feelings. They identified strongly with the American prisoners. They started to draw for the first time and were really proud of what they created. The French hankies are exhibited with my collection until the 7th of May in the MRAC, a museum in southern France. I’m currently making plans for a documentary about pinto art. My experience in a French jail totally change the preconceptions I had about the inmates, the guards and the “inside life,” so I’m hoping the film will help people to meditate on the prison system. I don’t know what the outcomes will be, but if a viewer is seduced by something produced by a prisoner serving a life sentence it is a positive step, right? For more information, please visit www.nationculblanc.com.